Still hunted by the church, Zadicayn has remained in hiding with his small family for seven years. But rumors of his location finally reach the Illuminati, a secret underground society of Black Magicians. 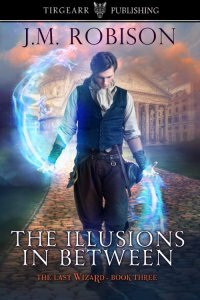 Wanting his magic for themselves, the Illuminati lure Zadicayn to Rome where the last wizard is forced to fight, not only for his life, but for his family, his magic, and for the world. Because his next death with be his last. The soul is a cavern, much larger than the body containing it. This cavern fills with memories, thoughts, feelings, decisions, and dreams until you are so full of it that surely it bleeds out of your pores and everyone who lays eyes on you while you stand upon the balcony above Saint Peter’s Square can see it. I’m so full of it all that it covers my robes in a blinding white. The throng below denies seeing it because the head of God’s holy church does not bow to threats and is not easily swept into coercion. Both of those fill my cavern wall-to-wall, so I can’t even feel the love I express to the people below me with my smile and wave of my hand. I pass through the curtains and enter the warmth of my chambers. Silly how the door to my incarceration is made of heavy red silk. If I had magic, I’d sprout wings and fly out of here like Icarus, even knowing what fate befell him. But magic is why I’m a prisoner to the Vatican. I sit at my table, hand shaking as I reach for my hot tea. I cup it in both hands, hoping the heat will soften the shake, though it’s not from the February chill. My recent plight has called to question many things which a devout, sober, Catholic mind would never have questioned. But my mind is not sober. It’s drunk on fear and desperation, the weight of which has deepened the cavern of my soul to reach new depths, new questions. Like, the Catholic religion should be held as the only religion of the State, that future popes ought never to come to terms with progress, liberalism, and modern civilization…damning thoughts for a pope of the Catholic Church. I flinch when the door opens. I spill hot tea over white knuckles. Carlo Vizzardelli enters. I made him cardinal in January. Hard to turn the position down to a man who was awarded the apostolic protonotary and became the consultant to the Sacred Congregation for Bishops. Three days after I gave him the red beret, he wasted no time outlining his position in the Illuminati and flexing the control over his demon. It took ten minutes for me to go from Pope Pius IX of the Roman Catholic Church to Slave of the Illuminati. I’d always heard rumors about them, but never that they called themselves Black Magicians and commanded demons from hell to perform wizardry for them. Or threaten me into doing what they want. Which was to rule Rome from behind me. The same day as my prayer to the Holy Father for rescue, I received my monthly report from Valemorren, England, concerning the status of the wizard they’ve been unable to capture again. I can’t decide if God wanted to double my worries or laugh at my troubles. I nod and sip my tea. He must see the tremor in my hands. He sits opposite me, laying a fresh sheet of paper and inkwell on the scatter of documents on the table. The other cardinals must see Carlo as terribly ambitious to meet with me one-on-one so frequently. But that oddity is pushed aside when compared to Carlo’s many other ambitions prior to his arrival to me. I see his own cavernous soul through his eyes. Now that I know him, I see the many tunnels and depths he’s bored to fit all his greed, lust, and hate. I don’t know why I was blind to it until after I knew him. He’s talking while he writes, but I don’t listen. I set my tea cup aside and nod when he looks up for my approval. It doesn’t matter what he writes. I’m going to sign it, whether or not I agree. If I don’t sign, he’ll drag me out to the Belvedere Courtyard where he’ll summon his demon and threaten to rip out my tongue, tear out my eyes, something to cause permanent damage to me while still leaving me alive. His threats are good enough; they keep me doing what he wants. Lord give me strength to resist and not care about any mortal maladies he may cause to fall upon me. His eyes light up. Every pontiff has heard at least the title of Fae Wizard. But because the pope before me actually had to deal with one six years ago–who was never caught–the task fell on me. I’m familiar with Fae Wizards, and because of Carlo, I’m familiar with the envy Black Magicians have had of the wizards since antiquity. I’m anxious to divert his gaze off me. I tip my tea off the table without care as I dig through the papers until I unearth the one which has, finally, diverted his gaze. He snatches it out of my hand. His eyes bump side to side as he scans the entire page. Though when he puts it down, he’s grinning, and I know he’s read every word. I shrug. My heart beats in my throat. If I open my mouth, he’s going to hear a rapid thud. He looks at the paper again. Black Magicians borrow a demon from Satan, and that demon performs requests for the magician. Since the demons are invisible to everyone but the magician, everyone thinks these performances are magic. Fae Wizards follow a different set of rules. I don’t quite understand the depth myself, but I know they use real magic and it comes from a different entity. And Black Magicians want the same thing. I clasp my hands on the table and nod. Carlo sweeps out of my chambers like he’s already missed the train, leaving his unfinished document on the table. I slam my eyes immediately in prayer. Dominus vobiscum, Fae Wizard. Defeat Carlo and free me from the Illuminati.